The Movement for the Emancipation of the Niger Delta (ME ND) announced Monday it had taken hostage six foreign crew members of a 'chemical tanker', Siehem Peace, some 20 nautical miles from Escravos in Nigeria's restive oil region. It listed the crew as Captain Yuriy Shastim, Chief Engineer Vasvi Bondarkov and 2nd Engineer Viktor Koshevoy (all from Russia); Cadet Banjit Singh Dhindsa (India) as well as Arivando Galima and Tavares Rouirgo (Philippines). ''For disregarding our warning to oil, gas and chemical tankers to keep away from the Niger Delta waters, six crew members from the chemical tanker Siehem Peace were seized...and will be held until further notice. ''Their arrest is meant to serve as a warning to others that there are root issues that have to be resolved with the Nigerian government before normalcy can resume, such as the return of displaced civilians to their ancestral home, compensation for damages, return of the ill trained JTF to their barracks and last but not the least, constitutional amendment to ad dress fiscal federalism,'' MEND said. The militant group warned that next tanker ''that is unfortunate to be intercepted will not be this lucky as it will be set on fire after evacuating the crew''. 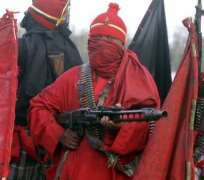 MEND has recently stepped up its attacks on oil facilities in the Niger Delta, following a military offensive launched against the oil militants mid May. The attacks have cut Nigeria's oil production by over 300,000 barrels per day.